Our fine art quality carvings include details such as positive and negative reliefs that cannot be replicated by any type of machine. 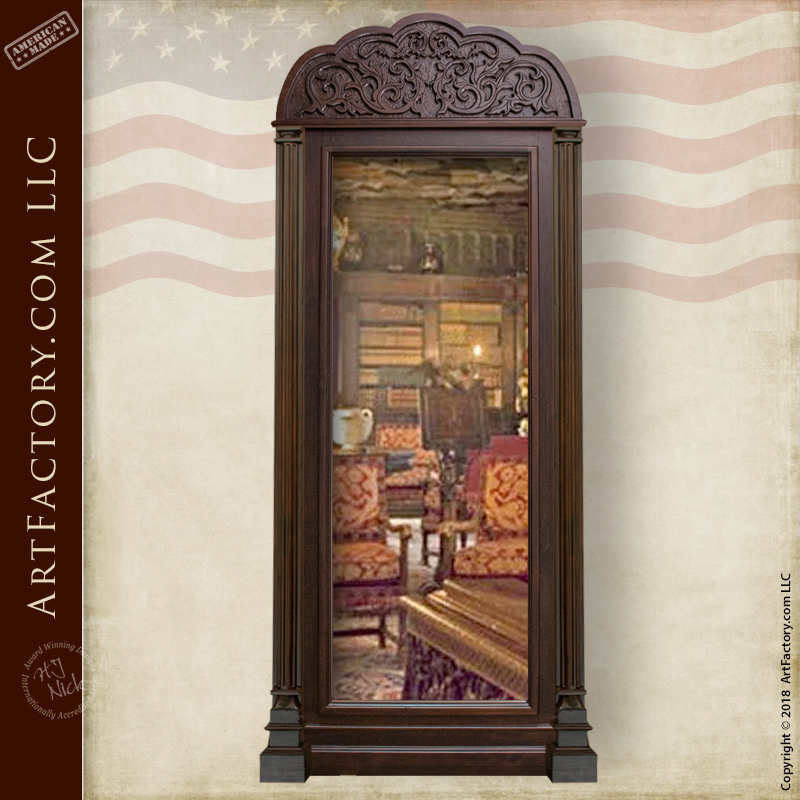 At ArtFactory.com, our hand carved doors are genuine works of certified fine art, and this hand carved mirror door is no exception. The Baroque inspired carvings are carved with a multi-level, high relief process that creates both positive and negative reliefs. This type of detail cannot be achieve using any machine. All of our wood carvers are classically trained in the old world methods of fine art carving. To be recognized as certified fine art, all carvings must be in the same hand and technique. That is why our products are never gang carved, CNC machined, or carved using any type of fast process. This assures that each door is a unique, one-of-a-kind piece. These details are especially relevant in the eyes of appraisers when qualifying a work as fine art. This hand carved mirror door is built from full length, naturally air cured, genuine, solid timber. Unlike the doors that you will find at big box retailers, when we say wood, we mean "The Real McCoy". We do not use particle boards, veneers, and laminates because fine art is never made with low quality materials. We construct our hand carved, solid wood doors with the same strength, and techniques, used by royalty in ancient times to fortify their castles and fortresses. Every door that comes out of our factory is constructed using hand hewn, pegged and dowelled, mortise and tenon joinery. This old world, tried and tested method of craftsmanship makes for a door that is built to stand the test of time. In fact, if it were not for these artifacts, it would be impossible to know these people ever existed, how they were important to history. This is also the case in the 21st century within your own family. No matter if it’s a simple, hope chest with your personal message or name as a gift to a loved one, or an extravagant, fine art quality, master handcrafted hand carved mirror door, these items will be important to the story of your family history long after we are gone. Each custom door is designed by, and built under the supervision of award winning artist H.J. Nick. The H.J. Nick signature stands as your certification that the product has been found to meet all world class fine art specifications. The meticulous finish has been done in age old technique, using a 23-step hand rubbed process. We begin with fine hand sanding, and infused open grain hand applied stains. That puts the finish in the wood not just sprayed on it. This allows for the fine natural wood grains to show to perfection. There are then 20 additional steps requiring the application of wax, oils and lacquers with curing times between each process. This method is performed on all furniture and door wood surfaces inside and out. This tried and tested finish detail is required in the making of a one-of-a-kind, family heirloom quality product that meets world class investment quality standards that will stand the test of time. This process is the only way with little maintenance and the simple process of cleaning with oil will allow for a beautiful natural patina that will make this hand carved mirror door more beautiful over time. All of our door hardware is hand forged by master blacksmiths from solid wrought iron. Hand hammered into shape over a coal fired forge, and patina finished, all of our custom handles, locks, and hinges are guaranteed to stand the test of time with little or no maintenance. Customizable, master blacksmith hand forged iron hardware can add the finishing touches to any of our custom wooden doors. This hand carved mirror door feature our stylish old world door handle, and our custom slide bolt latch on the back side of the door. This classically styled hardware pairing is extremely versatile, and can be added to any of our custom doors. Our blacksmiths hand forge, and hand patina finish each piece of custom hardware to perfection. Every hardware product is hand hammered over a coal fired forge. Our proprietary, hand applied, heat infused, advanced patination process assures that you will have the perfect custom door hardware. With this process, a hand applied iron oxide patina is infused to the metal at over 1000 degrees Fahrenheit. This assures that it will stay beautiful for years to come with little or no maintenance. Our in-house master wood workers, and blacksmiths handcraft all custom doors and furniture to your design specifications. We only use the highest quality materials. All of our wooden furnishings, doors, and gates are made from solid, full length, naturally air dried timber. We believe in the quality of our products in craftsmanship so much that as result, our custom interior and exterior doors and all of our products are guaranteed forever. Call now for a custom quote on the hand carved mirror door at 1-800-292-0008, or any of our other fine art quality custom entrances. Like all of our products, this door was handmade in the USA at our Scottsdale, Arizona factory.